I'm certain I don't need to talk about old card and new cards with you folks. It's a given that as collectors, we gravitate to what we like, whether we are a prospect hunter or a set builder. Putting together a rainbow of a current super star, or building a collection of a old time player. I had stopped by mt LCS today and was just hanging out with the owner, his son and one of the regulars there. Someone stopped in to sell an old collection of cards (which Brian bought) and we looked at some of the cardboard. Now Chris, the owner's son, is really well versed in book value and actual value (since we all know book is BS), while Tony - he is a prospect hunter. So as the three of us are looking at the stuff Brian bought, Tony was not sure the price of many of the cards. Stuff like a '57 Mays, '61 Gibson, '73 Clemente - yeah, there was a lot of nice cardboard in the binder, But the most amazing thing was some loose leaf pages at the front where it was listed the price of the card. Not sure if it was the price paid, or the value of the card, but needless to say, the prices were old. Like a '51 Mays at $7. Or a '61 Gibson for $1.50. How about a buck for a '73 Clemente? Other names and prices on these sheets included $4 for a '64 Brock and listed (but not in the binder) was a '65 Mantle for $30. Either the seller nailed the prices, or those pages were really old. Old and new comes with traders too. I have an old trader in Kerry with Cards on Cards. One frigging year I will win a prize in his football contest, but I'll have to settle for a semi yearly package from Kerry. And that is a good consolation when the envelope is packed by Kerry. What else is getting old is Topps lack of ability to find Southpaw's name and print it on his Opening Day card. They had it right in 2007 and 2010 (I think - I cannot find photographic proof). But from 2011 on, he's White Sox Mascot. Topps - IT'S RIGHT FRIGGING HERE!!!! Main page > Community > Southpaw. Sooz, can you help them out? How about some old players on newer sets, like Nellie in the Ted Williams release? 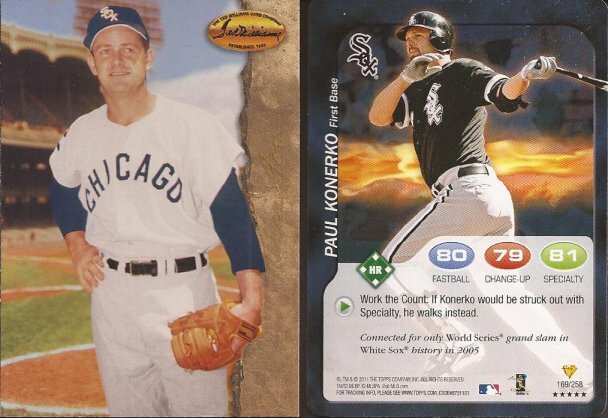 And a new Paulie for my collection. Hits are a guarantee in a Kerry package, it seems. Nice Appling foil for the Cooperstown binder. Yup - I put the 2 sets into a binder. I'll scan it when I get the insert sets done. 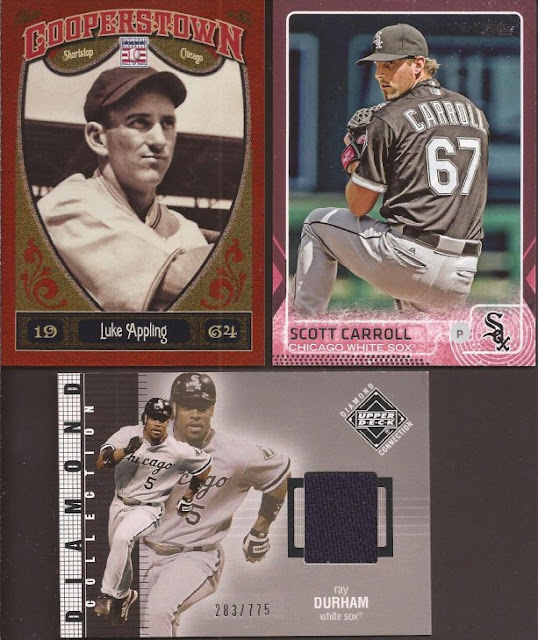 My first pink of any White Sox player with Scott Carroll. And a nice relic from a quality 2nd baseman. Thanks again, Kerry. I hope someone brings me back a donut while they're over there. Ok, as I was saying, I forgot how I found Greg, but I caught a post where he was looking for '92 UD cards. I had recently ripped a box of that from my LCS and had a crapton of dupes. Then I misplaced the cards I set aside for him. Greg was on the j-o-b dropping me some cards, and fortunately I found the stack and sent it over. Greg knows how to fill and envelope with cardboard. Old uniforms on new cards made to look like old cards. 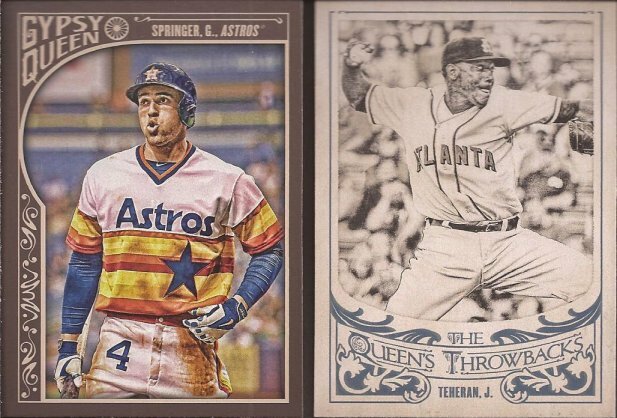 I am 7 cards away from completing the Queen's Throwbacks. 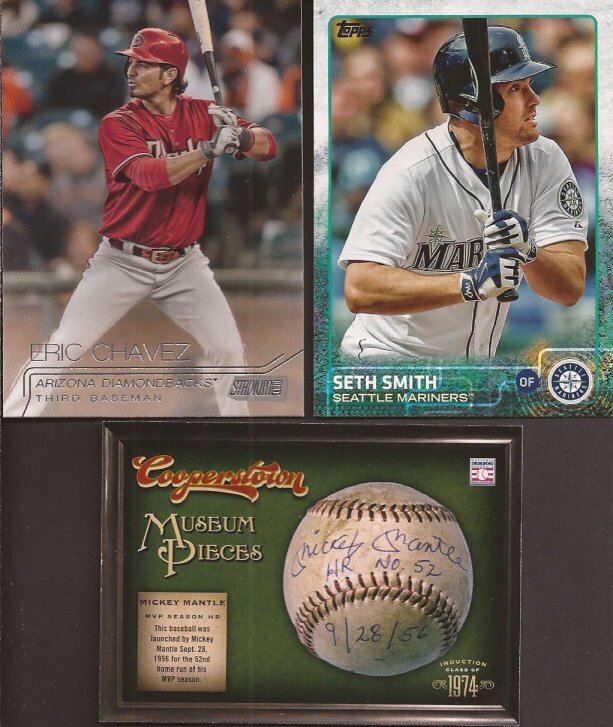 Four are currently in the hands of USPS from a Sportlots order. Tons of set help from Greg. These three are just the icing of the 3 tiered cake of set needs. Gotta say this - that Chavez is kind of a boring Stadium Club shot. Right? NICE!!! I'm going to miss Alexei in the hole come 2016. I understand the reasoning, but that doesn't mean I won't miss him at shortstop. I think he is underrated defensively at the position. That sweet auto in the middle of the last man ever to wear 3 for the White Sox is the third in my collection of Harold. It's the replacement for an auto/relic I currently have in the Project 2005 collection. That card is fine, but I think this one from Greg is much cleaner. Greg, I look forward to more mailings in the future. Cuz anything I receive is all new to me. Did you walk away with any of that old cardboard from the LCS? Ray Durham was a solid player for a while, kinda forgot about him. Love this pink aka bubblegum cards. I feel the same way about Alexei, I liked him and I'll miss some of those amazing plays he'd make at short, but I guess I understand the decision. Alexei was my favorite Southsider - it's a shame his skills diminished so suddenly and drastically. Hopefully he can figure things out in San Diego. Anyway, gotta love any card that sports the Winning Ugly throwbacks! Maybe Southpaw hasn't signed an agreement with Topps yet to use his trademarked name? That is friggin crazy. Now that you mention it, they do that with several others like Oriole Bird, Homer the Brave, and Slugerrr (Royals). Weird!